Elsner Well Drilling, Inc.'s History - ELSNER WELL DRILLING, INC.
﻿﻿﻿﻿﻿﻿﻿"Where Elsner Goes, Water Flows"
Kelly Elsner was raised on a Drill Rig near Alexandria, MN. His grandfather started a Well Drilling business in 1958 and the legacy was passed down to his father and uncle. By the time Kelly was 10 years old, he was drilling Wells with a Cable Tool Rig in the summer and repairing existing wells after school. After high school, Kelly moved to the Park Rapids area and started his own well drilling business. At just 19 years of age, he was the youngest man to be a licensed well driller in the state of Minnesota. Since then, Elsner Well Drilling, Inc. has expanded to servicing the entire state of Minnesota. We have been in business for over 32 years and are three generations strong. Our phones are answered 24 hours a day, 7 days a week, 365 days a year. With the latest in Technology, the most Modern Equipment and Trained Technicians we are capable of handling each and every job that comes our way with confidence, professionalism and Dependable On-Time Service. Elsner Well Drilling, Inc. 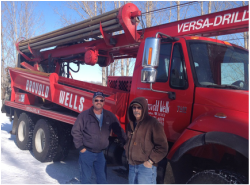 Purchases Brovald Wells, Inc.
Elsner Well Drilling, Inc. recently purchased Brovald Wells, Inc. out of Fosston, MN. We will continue to provide the same great service as Brovald Wells, Inc. and we look forward to servicing the Fosston area. About Elsner Well Drilling, Inc.
Elsner Well Drilling Inc. is ﻿LICENSED﻿, ﻿BONDED﻿, and ﻿INSURED﻿ with the State of Minnesota. the International Ground Source Heat Pump Association and the Lake Region Builders Association. Kelly Elsner has held the position of President of the Minnesota Water Well Association and is still an active member of the Association. To the right you can see the Minnesota Water Well Association members in Washington D.C. at a MWWA conference. Kelly and Laurie Elsner are in the back row, second and third from the left. "Where Elsner Goes, Water Flows"